We know you love garlic bread, so go one step further and toss in some Parmesan. Our Garlic Cheese Bread is the perfect partner with pasta and Caesar salad. Dinner is served! Mix 1 cup Kraft 100% Parmesan Grated Cheese with 1 Tbsp finely chopped parsley, 1 tsp minced garlic and the ADD-IN of your choice. 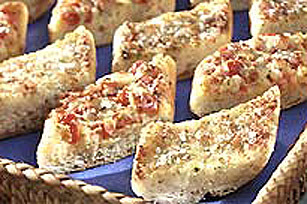 Combine all ingredients; spread on baguette halves and sprinkle with additional Parmesan Cheese. Broil until hot and bubbly with a light golden colour. BRUSCHETTA: any of the above add-ins plus a chopped tomato. Use Miracle Whip Calorie-Wise Dressing and Kraft 100% Grated Parmesan Light Cheese!